Randy Newberg, of On Your Own Adventures, called and asked if I would be a guest hunter on his show for a Montana wolf hunt. I was excited and thankful that he would call me to join him, especially considering I had zero wolf hunting experience. 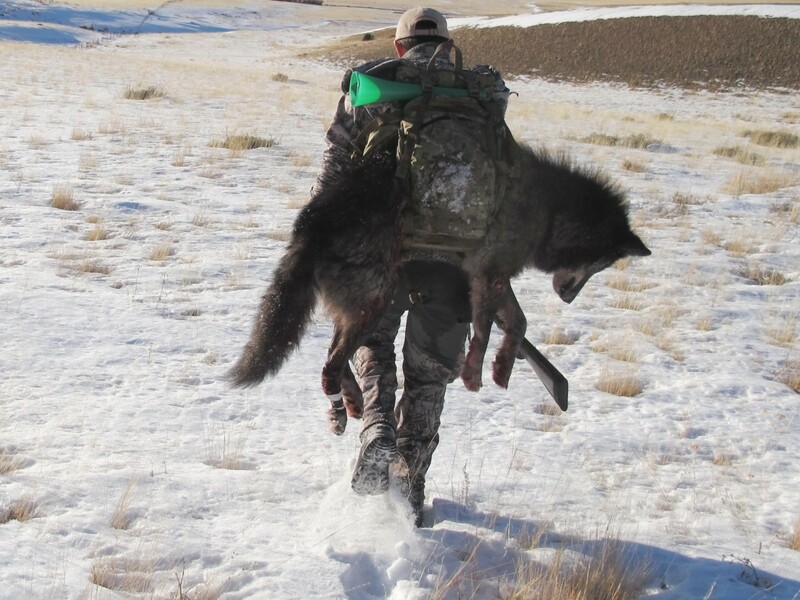 Randy and I talked, and we both understood this hunt wasn’t likely to end with much in the way of wolf footage, and even less likely to end with a dead wolf. But Randy and I both have the same philosophy when it comes to hunting: The odds might be stacked against you, but the odds drop to zero if you don’t at least give it a try. 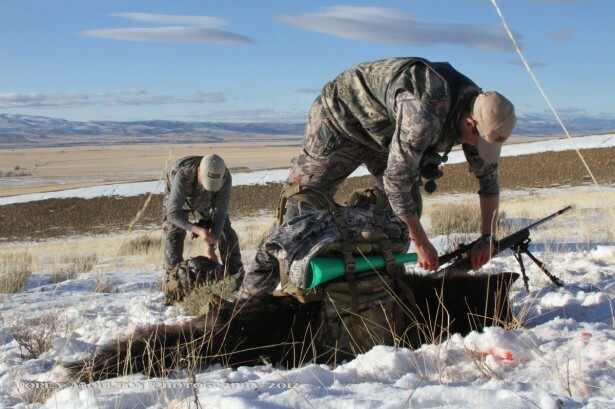 We spent five straight days hunting for one of Montana’s most elusive creatures. Our expectations were low, so we were thrilled when we spotted our first two wolves late in the afternoon of the first day. Under normal circumstances, we would have had a shot at them, but the camera guy was unable to locate the animals in his viewfinder, so I had to pass on the shot. I was learning, painfully, that trying to capture the harvest on film adds a significant level of difficulty. Nonetheless, it was more excitement than we had expected for the first day. 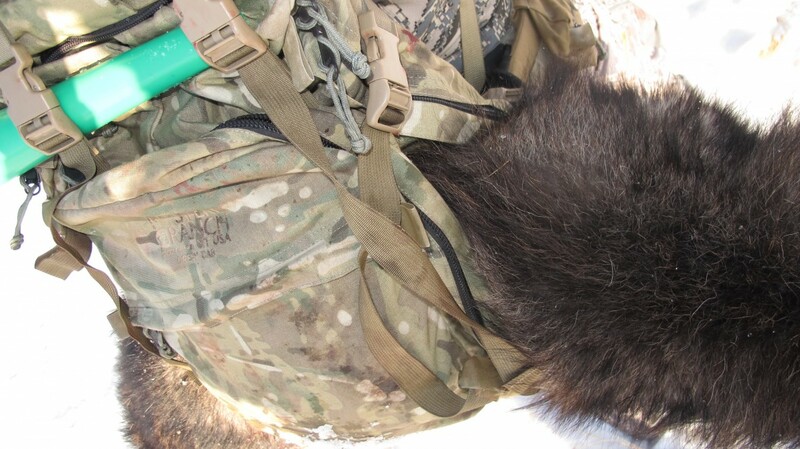 The subsequent four days of hard hiking and glassing in sub-zero weather, left us with little to show for it. We were fortunate enough to see wolves again, but we couldn’t get within range. When the professional camera guys ran out of time, Randy and I decided we would still try to get a wolf anyway. But two weeks later, Randy called again, and said he was able to get the camera crew for another five-day window in January. So we held off for them, and when they arrived, we went back to our old location. It seemed most of the elk had moved out, and we figured it was likely that the wolves had followed their food. That meant starting our second five-day hunt at square one in a brand new area. The entire first day was gobbled up by learning the lay of the land. On the second day, we loaded up our Crew Cabs with spotting scopes, cameras, tripods, and the rest of our necessities and cruised to a high vantage to glass as much country as possible. We did the same on the third day as well. In the late morning of the third day, I spotted a group of bull elk about four miles away, all of them necks wrenched and looking back. Something had their attention, so I watched. Nothing at first. For ten minutes they stood frozen peering back over their shoulders down the hill below, their antlers curling high above their bodies, full of tension, ready to dart. And then, 30 yards below the bulls, appeared a beautiful black wolf, lined in silver. And so began the chase. The wolf kept its heading, straight away from where we’d been. 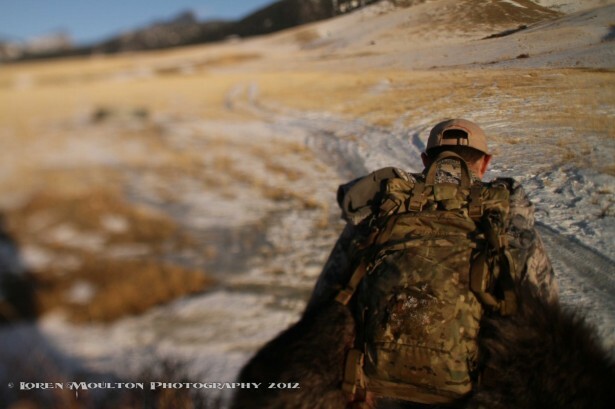 But three hours and nine miles later, we found ourselves in the one position we’d dreamt of but never thought possible: closing the distance on a Montana wolf, now within shooting range. The cameras were set. I threw the bipod down on the rifle and readied for the shot. Randy called out the range at 510 yards. The wolf was on the move, and we yelled to stop it from disappearing into a draw. “I got him,” the cameraman said. I settled the crosshairs, and began squeezing the trigger. At the report of the rifle, the wolf disappeared into the draw. “You smoked it!” Randy yelled. I wasn’t so sure. The wolf came up out of the draw, and we could see it had been hit. We shot again, and it went down quickly. Walking up on this wolf was utterly amazing. It was bigger than I had imagined it would be, and its fur was long and wild. The odds were stacked against us, more than any other animal I’ve ever pursued, and yet it worked out. 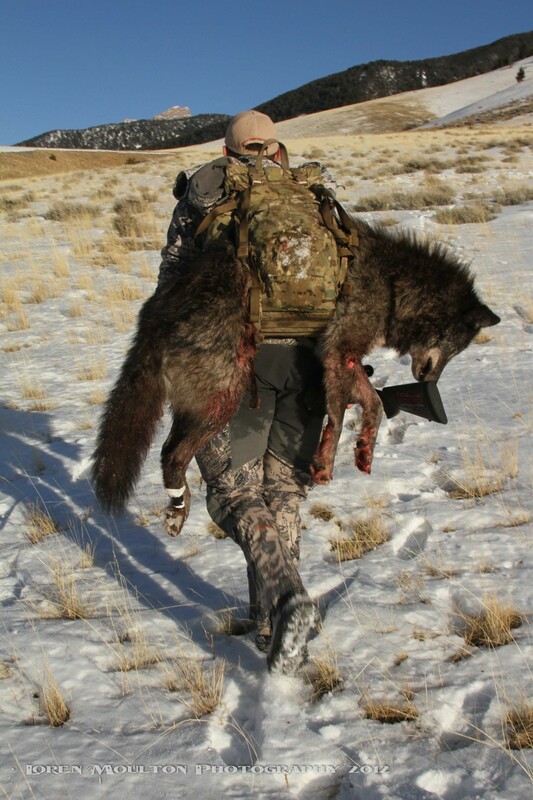 This may be the first wolf ever harvested on film in the lower 48, and it’s quite possibly the first wolf to have ridden in one of the best hunting packs in the world. It quite simply doesn’t get any better than that! Stay tuned! The hunt will air this summer as part of On Your Own Adventures with Randy Newberg on the Sportsman Channel.